Wanpeng Guo is a former principal sheng soloist at the Chinese National Orchestra. 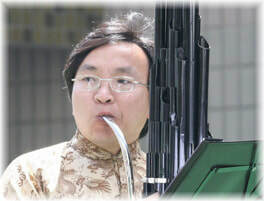 Guo is a member of China Musician Association and Chinese National Orchestral Association. When studying sheng, guan-zi, and suo-na under the wind master Wu Zhongfu, he was a soloist in Beijing Youth Palace. At the age of 18, he entered the Chinee National Orchestra as first principal of the sheng section. In 1994, he attended Asian Orchestra formed by a group of Chinese, Japanese, and Korean artists. In 2000, he was invited by Singapore Orchestra as a guest musician. He visited the United States, France, Germany, Australia, Denmark, and all Asian countries, played many solo programs, and made many recordings.